In Monday’s press conference following the resignation of Ole Miss head coach Andy Kennedy, sophomore guard Breein Tyree said he was going to give it his all the remainder of the season and play harder than ever before for the University of Mississippi. He took that mentality with him into the Rebels’ game at Missouri Tuesday night and carried Ole Miss on his back for the 90-87 overtime victory that snapped the Rebels’ seven-game losing streak. The win also gives acting head coach Tony Madlock a 1-0 record at the helm in Oxford. Tyree finished with a game-high 25 points on 9 for 22 shooting. Terence Davis added 19 points on 7 of 13 shooting, including making 3 of 5 shots from 3-point range. Davis also notched six rebounds, three assists, and four steals. Ole Miss (12-16, 5-10 Southeastern Conference) played well for the entire game. Even when the Tigers were battling back from a double-digit deficit, the Rebels stayed poised and confident as a unit. Ole Miss took care of the basketball, turning it over just 11 times. The Rebels also took advantage of their opportunities from the free throw line, making 15 of 16 shots. This type of performance is what former coach Andy Kennedy had hoped to see out of his players. After the loss to Mississippi State last weekend, Kennedy, ever the class act, said he felt the program might need a new voice moving forward. On Tuesday night, that new voice was Madlock. The Rebels’ interim head coach was thrilled with his team’s victory. “It was so exciting,” Madlock said of the win. The Rebels definitely played loose and free-spirited, leading the Tigers for over 36 minutes. They did not flinch when Missouri (18-10, 8-7) took a six-point lead with 2:38 remaining in regulation. Tyree, who was nothing short of a scoring machine, drilled a floater with three seconds left to send the game into overtime. The Rebels led for the final 4:14 of overtime, but their lead stayed within one possession throughout the period. Ole Miss showed its tenacity, once again, however, when with 15 seconds left and Ole Miss up one point in overtime, Terence Davis met the Tigers’ Jordan Geist with a monster block. 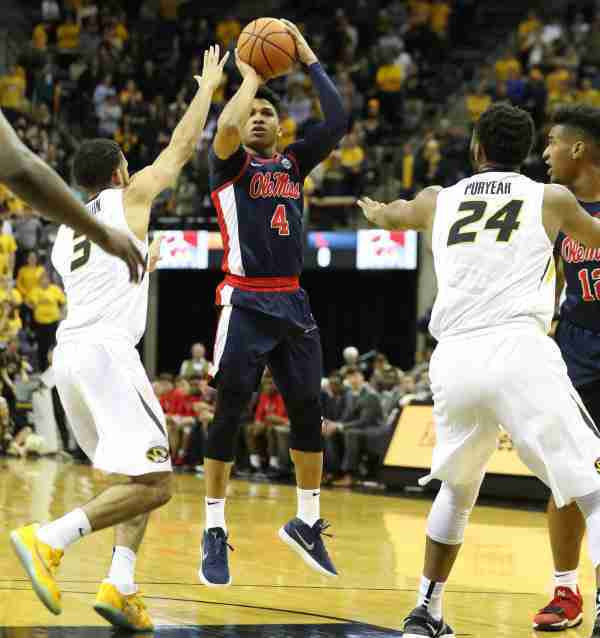 This team took smart shots and maintained possession at crucial times, and Ole Miss found a way to leave Columbia, Missouri with a win over a Tigers’ team that could be heading to the NCAA Tournament. Right now, this is arguably the Rebels’ biggest win of the season–and there are still games left to play. While Ole Miss may not be an NCAA postseason tournament team this year, the Rebels would love to play spoiler to the other programs at the top of the SEC who are looking to lock up a postseason berth. Ole Miss hosts Tennessee Saturday, February 24 in The Pavilion. The Rebels and Vols will tip off at noon.